Wonderful as a scrying bowl or for snuffing and resting your smudge sticks. 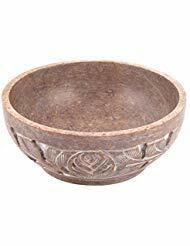 This bowl has been sculpted from soapstone to depict a vivid floral pattern on its exterior. Measures approx. 5" x 2".